The Dodgers need pitching help. Greinke might not be coming back after declining his mutual option for 2016 and Anderson isn’t a great No. 2 starter and using 16 starters is an absurdly large number. They have depth coming back in Ryu, Brandon McCarthy and Mike Bolsinger, but those names don’t strike fear in anyone. They could also add another bullpen arm for depth, although it’s not necessarily a priority. Kenley Jansen is one of the game’s top closers and gets a ton of support from power arms like Yimi Garcia and Chris Hatcher. J.P. Howell had a phenomenal year as their lefty specialist, posting an ERA of 1.43 with 39 strikeouts in 44 innings, but the Dodgers could use one more arm and some depth. Obviously, Grienke is the top target this offseason. Now that David Price and Jordan Zimmermann are off the table, the top-tier starting pitching is thinning quickly. If the Dodgers strike out there, the next move would either be to sign someone at the top of the second tier (Mike Leake) or look for a trade involving Puig. Rumors have surrounded Puig and his status with the team for over a year and this could be the time to make a move. The Indians or Mets are ideal trade partners as both teams have young, team-controlled pitching depth and are in need of offense in the outfield. Reliever Darren O’Day is the top relief name in the market right now, but the Dodgers might not want to spend that kind of money on a supporting reliever. Aaron Crow, Steve Cishek, Al Alburquerque, Yusmiero Petit and Greg Holland were all non-tendered this week, with Crow missing all of 2015 recovering from Tommy John’s and could be worth a flier, although Holland probably won’t pitch in 2016. Greinke is reportedly between the Dodgers and their rival San Francisco Giants. He’ll be the number two starter on either team, playing Robin to either Kershaw or Madison Bumgartner, so the decision is about the contract. 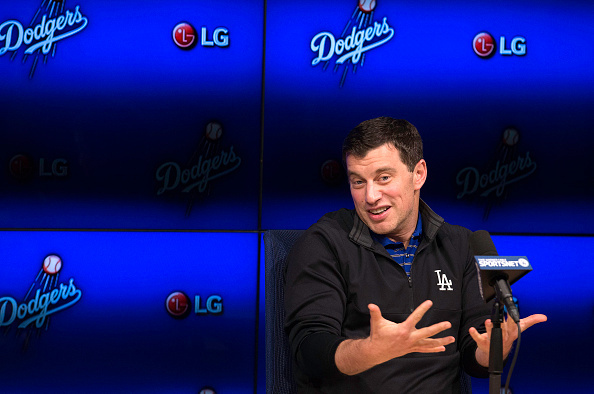 The Dodgers typically win these bidding wars and I see it happening again. Cishek had an awful year with the Miami Marlins, but that’s an outlier compared to the rest of his career. After he was traded to St Louis, Cishek looked much better especially after being taken out of the closer’s role. He’s exactly what the Dodgers are looking for; proven talent that can be signed cheaply due to a down year. Everyone needs starting pitching. In today’s game there’s a constant demand at the position and there’s a relatively thin crop of starting pitchers out there, especially since Price and Zimmermann are signed. The Giants have four MLB-ready starters on their roster in Bumgartner, Cain, Heston and Peavy, but Cain and Peavy have struggled to stay healthy over the past few years. Luckily, the Giants continually churn out pitching prospects – Top prospect Tyler Beede is close – and typically find diamonds in the rough. That’s not going to be enough to push them into contention though; they need a Watson to Bumgartner’s Holmes. The Giants outfield is Gregor Blanco in left, Angel Pagan in center and Pence in right. That could be the least powerful outfield in baseball. They lost Nori Aoki and Marlon Byrd to free agency, leaving them a few outfielders short. The Giants can’t rely on another 20 home run year from Crawford and Posey can’t do it himself. Blanco is a great fourth outfielder, not a starting corner outfielder. Look for the Giants to fill that spot externally. As mentioned in the Dodgers preview, the Giants are in the running for Greinke and would quickly transfer the top pitching duo mantle to the Giants. If they don’t get Greinke (and I don’t think they will), the Giants should shift their focus to one of the top outfield bats on the market. Jason Heyward, Justin Upton and Yoenis Cespedes are the top guys on the market and should be targeted in that order, but Alex Gordon might be the best fit of them all. He’s a great defender, clutch hitter and has enough power to make a difference in their lineup. The three pitchers the Giants need to target after Greinke are Yovani Gallardo, Scott Kazmir and Mike Leake. The Giants traded for Leake halfway through the season and are already familiar with what he can do; put your team in a position to win. Kazmir is probably the most talented at this point, but all three are solid second bananas and the Giants have one of the premier pitcher’s parks in the game. This just makes sense to me. It’s more of a gut feeling than anything else, but Gordon feels like he’ll just fit with the Giants, have a couple clutch defensive plays, a walk-off and lead the Giants to their fourth straight even-year World Series ring. Kazmir hasn’t gone over 200 innings since 2007, but was fantastic in the bay area with Oakland last year with a 2.38 ERA in 18 starts. Kazmir struggled with Houston after the trade, but the Giants typically bring the best out of pitchers. Hell, they made Ryan Vogelsong a solid MLB starter. Kazmir will have one of his best seasons in a Giants uniform. Pitching, pitching and more pitching. Every team needs it. Like the two teams above them, the Diamondbacks are looking for that 1-A starter to support the stud they already have. This is an incredibly young team with still more talent on its way, so infusing some veterans into the team should be a good idea, especially in the bullpen. Right now, Owings and Aaron Hill are slated to compete for the second baseman job. Neither of them posted an OPS above .700 with Owings coming in at .587. The Diamondbacks should upgrade at second base and bring in someone with playoff experience to fill that role if they’re serious about making a run in 2016. The Diamondbacks have already been rejected once by Johnny Cueto, but are continuing the pursuit and are determined to sign him. They could also look at Leake, Gallardo and John Lackey in the free agent market. Their apparent second choice is Japanese righty Kenta Maeda, who is about to be posted by the Hiroshima Carp. There’s been rumors about a trade with the Atlanta Braves involving Shelby Miller and Pollock, but I don’t the the D-Backs giving up Pollock without getting a major haul in return. If there’s going to be a trade, it’ll be for a bullpen arm. The Diamondbacks have been linked to Cincinnati’s Aroldis Chapman, Tampa Bay’s Jake McGee and Brad Boxberger and the Yankees’ Andrew Miller. Miller isn’t going anywhere and Chapman’s price might be too high so McGee and Boxberger make the most sense. The premier second base options in free agency are Howie Kendrick, Ben Zobrist and Daniel Murphy. One of these guys will end up in Arizona. Arizona has been publicly pursuing Cueto more than any other team and I think they’ll come around to his terms. Cueto’s value isn’t as high as it would have been last year after seeing him struggle down the stretch, but he’s looking somewhere in the 22-25 million range per year, a few short of Arizona’s 6-year/120 million offer earlier. Arizona will cough it up eventually. Zobrist is 35 and is probably looking at his last big deal, unless he shows very little regression at the plate. Arizona is one of the best places to prove that he still has it. Zobrist seems to favor the veteran role and would fill that nicely on a young team. Braden Shipley is ranked as the number 4 prospect in the Diamondbacks organization, but is being outpaced by Aaron Blair and is blocked by the youth currently in the rotation. McGee has had two stellar years in the Rays bullpen and would provide a righty-lefty combination with Brad Ziegler at the back-end of the bullpen, giving manager Chip Hale plenty of end-of-game options. The Padres have an interesting set of problems in their lineup; second and third base are locked down by Jedd Gyorko and Solarte, respectively and catcher Derek Norris was fantastic last year, but everywhere else is full of questions. Will Kemp or Myers move to first? Who is going to play shortstop? Who will fit in the two remaining outfield spots? There’s just a lot of holes that won’t be permanently filled in one offseason. Currently, the Padres have a ton of starting pitching. Shields, Ross and Cashner all have top-of-the-rotation stuff while Robby Erlin, Colin Rea, Casey Kelly and the newly-acquired Pomeranz will compete for those last spots. The bullpen is lacking a back-end after trading away their set-up man and the closer but could be filled internally. San Diego has a few prospects to help fill the voids will need to tap into either the trade market or free agency. Hunter Renfroe (MLB.com #2 Organizational Prospect) looks ready to take over in left while Kemp and Myers decide who will move to first (likely to be Myers). That leaves center field wide open, but with top prospect Manual Margot (MLB.com #1) just a year away, signing a long-term solution doesn’t make sense. Denard Span and Dexter Fowler are the two top center fielders in the market and Austin Jackson hasn’t been able to put it all together, but is still young enough to be intriguing. Ian Desmond and Asdrubal Cabrera are the top shortstops and the Mets and Padres don’t have a shortstop they’re happy or stuck with. Ideally, the Padres would sign one of these two, but there’s a better chance of acquiring a long-term solution through a trade. Again, bullpen help is always welcome and there’s a few guys out there that might be looking for a career-revival. There’s few places better than Petco Park for a pitcher looking to prove he still has it. This is a buy-low candidate with a few more chances to put it together before being relegated to a fourth outfield spot. He’d provide a stop-gap solution until Margot is ready to take over and, if Jackson performs well, would be a trade candidate come July. Padres trade Tyson Ross to the Chicago Cubs for Starlin Castro and Carl Edwards Jr.
Starlin Castro proved he still has it at the end of 2015 and would fill a major need for the Padres. Edwards Jr. has a live arm with a ton of movement and slots as a back-end bullpen guy. He was moved to the bullpen in 2015 but could start if the Padres stretched him out again. Ross fills a need behind Jake Arrieta and Jon Lester with the Cubs. First base is currently manned by Ben Paulsen, an average hitter from the left side with decent defense. Ideally, the Rockies would like to platoon Paulsen with someone with power from the right side until a permanent solution can be found. Kyle Parker was supposed to be that guy but was awful in 2015. Pitching is a desperate need in Colorado, but pitchers don’t sign there unless they don’t have any other choice. This is where a talented GM comes in handy; Bridich has to find the bargains that will still perform at altitude. Again, the Rockies will be bargain shopping. It worked pretty well last year; Nick Hundley was fantastic and despite a rocky stretch John Axford was solid out of the pen. We’ll just ignore the Kyle Kendrick signing and call it a wash. There are three guys the Rockies should go after; Henderson Alvarez, Mike Minor and Brandon Beachy. All three were non-tendered by their teams and are proven talent coming off of down years and injuries. Alvarez might be out of their price range and Beachy likely won’t hold up in the thinner air, but Minor fits as a bounce-back candidate. In the bullpen it’s the same deal; time for the Rockies to bargain shop. Albuquerque, Crow and Holland will show up on the Rockies radar, but will other offers and try to steer away from Coors Field. One name that’s intriguing is Neftali Feliz, the one-time ace and closer for the Texas Rangers. He had a terrible year in Detroit but is exactly what the Rockies are looking for; a talented guy who is looking to rebound. Chris Davis would mash in Colorado. He’s way out of the price range for Colorado, but man is it exciting to think about. Chris Carter is the more likely signing for the Rockies, proven power from the right side. Cleveland needs power in the outfield and CarGo provides a lot of it. We finally were blessed with healthy CarGo, the guy who the Rockies thought would be a perennial MVP candidate with Tulo. He’s under control until 2019, hence the hefty price tag. Salazar is a high-strikeout guy and would slate in as the top starter for the Rockies while Zimmer would replace CarGo in right for the Rockies. This is a future move. Holland won’t pitch in 2016, but would slide in with Adam Ottavino at the back end of the bullpen in 2017, when the Rockies expect to contend. Holland was a part of the three-headed monster Kansas City rolled out in 2014 and was great last year until his injury. Not many teams are willing to pay a guy to be on the DL for a full year, but it’s a savvy move; something no one has ever said about the Rockies. Previous Previous post: Casey’s Statistical Follow-up Series: Who is the 2015 MLB Stopper of the Year?